Making Extra Income: Making extra money is always a bonus. No contest. You can involve our 20 website project. Nothing on this page is going to get you rich, but sometimes it’s just about making a few extra couple thousand dollars each month. Referral Incentive by joining individual web site netwok: For example Real estate. 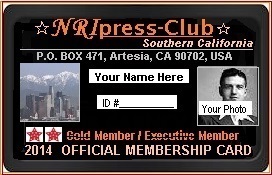 To represent yourself as a NRI Community representative or behalf of press to local Mayors, police heads or congressmen. When travelingh in India, you can use it where you feel helpful at airport, hospital, police stations or in offices. In any difficult time, you can contact local media or our head office for help.